The urgent area of interest is the top left corner. White 1 connects the stones as the white group tries to ecape from pressure. Black 2 is a sacrifice and perhaps a mistake. White 3 is a huge mistake. White had to play at 4 and was going to: but suddenly hallucinated that four stones are about to be captured. Back 4 is an atari, so White has to capture with 5. 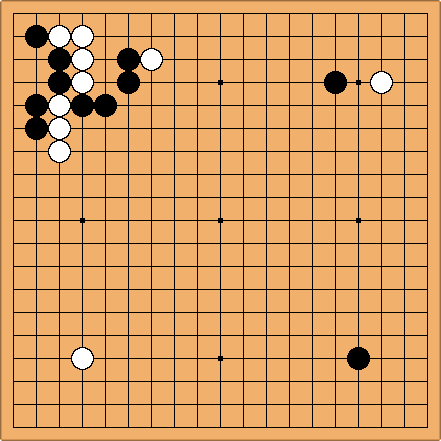 Black takes the white stone in a ladder with 6 and White has to survive, forcing with 7 and then adding the second eye with 9. White is alive, but only just, in gote. Moreover, Black 10 captures a single white stone and gets a ponnuki. This is painful for White.